Weight loss can be difficult for people who are overweight, battling unhealthy diets and a lack of exercise. Yet one young woman from Los Angeles turned her life around after realising something had to change. 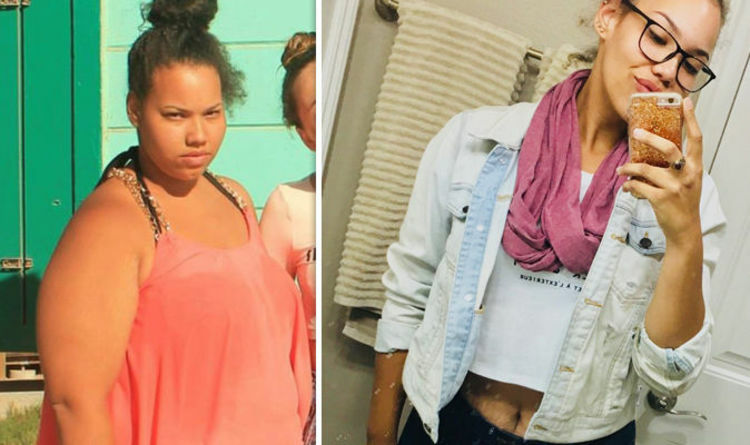 Dominique Montgomery, 22, from California used to fit into XXXL clothing after binge eating fast food and takeaways and weighed over 21 stone. It wasn’t until she nearly died that she realised something had to change. In 2015, Dominique got into trouble when swimming at the beach and the tide began to rise. She explained: “All of a sudden, the tide got high. “Everyone managed to push themselves out of the water onto some rocks, but I was stuck, because I wasn’t physically able to lift myself out. Despite realising something needed to change, she admitted to struggling with dieting since the age of five. Her portions exceeded the healthy recommendations, eating “at least 5,000 calories a day”. After the incident in the sea, she began building up her stamina by going on long walks, before trying jogging and hiking after becoming fitter. She also ditched the fizzy drinks and fatty takeaways and since lost over 10 stone and fits into a size 8 to 10. However, a side effect of the weight loss means she has a large amount of excess skin on her stomach, arms and thighs which could cost thousands to remove. Dominique is now crowdfunding to try to raise the money for the operation, as she states that exercise such as jumping jacks are now “painful”. Despite this, she offers advice to others who want to try and lose weight and uses her story to encourage them to keep going. She said: "You will have ups and downs – there have been days where I messed up, but I didn’t lose sight of the overall goal. Another young woman lost half her body weight by cutting out her crisps habit.